This summer there is absolutely NO excuse not to get out there and get moving. Chicago Athletic Clubs is proudly hosting this years' FREE Summer Fitness Series at Gallagher Way outside of Wrigley Field in Chicago! This is your summer opportunity to be fit, have fun and stay outside with some of the best group fitness class instructors in the city of Chicago! Check out our 28 Days to a New You Guide! This is a 100% FREE fitness series with workout classes open to everyone, taught by our amazing Group Fitness Instructors from right here at CAC! There's yoga classes, cardio classes, Pilates classes, strength classes and a running club - so, basically, something for everyone. Oh yeah, and did we mention its FREE? All you have to do is complete an online waiver before attending (waivers will be available at the events as well). When can I go to these awesome free classes at Gallagher Way? These classes happen every morning Monday through Thursday, and Saturday Run Club. The full series goes through Saturday, September 29th, but don't wait to join up! You can check out the schedule below, complete with instructor bios and class descriptions. See you at the park! This is THE high intensity interval training class you won’t want to miss! 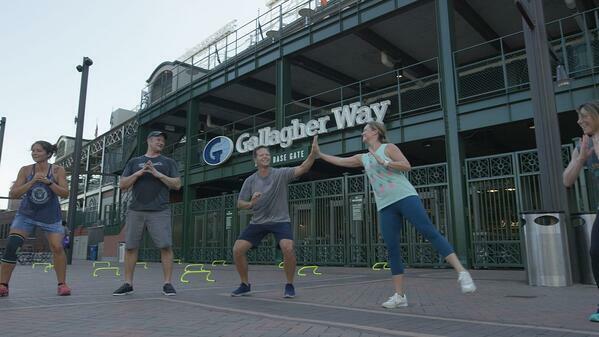 The HIIT Summer Series cardio workout on the Park at Wrigley is designed using a variety of exercises to improve your athletic capability, increase metabolism and burn fat. By combining high intensity exercises such as running, lunging and jumping with active recovery intervals, you will feel and see the results fast. Words of motivation: You will feel your heart beating fast and your muscles burning. Each week there will be a variety of exercises and the work to rest ratios which will continue to challenge your body and improve your endurance. You will leave classes ready to conquer the day and excited to come back for more classes in the Park. 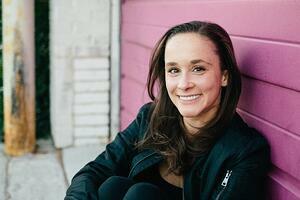 When not teaching: Katie is visiting her family in the suburbs or finding "me" time. Guilty pleasure: holiday-themed Reese's Peanut Butter shaped candy. Pumpkins, Christmas trees, Hearts, Easter Eggs. Everyone needs a little sweetness in their life! Challenging the skill level of each participant, from beginner to advanced, Multi-Level Yoga improves mobility and flexibility, increases strength, builds endurance and develops a stronger mind-body connection through breath control, simple meditation and the adoption of specific poses. BYOM (Bring Your Own Mat). In the Studio: Initially attracted to the physical practice, I quickly realized how much the meditative and spiritual elements of yoga were positively influencing my life. I find the practice of yoga to be a powerful connection between the mind, body and spirit. My classes are multi-level, creative, energizing and welcoming with music that connects us all. I genuinely loves working with students of all levels and hopes to help them find the joy, connection and dedication through their practice as she has found. My goal is to bring everyday life to yoga and yoga to everyday life. On the mat and off the mat. When not teaching: reading, writing, practicing yoga, catching up for coffee with loved ones. Guilty pleasure: Big fluffy robes and socks (the kind that go up to your knees and lots of showers and baths throughout the day--love feeling clean! To complement HIIT SS: Cardio, the High Intensity Interval Training Summer Series: Strength workout incorporates strengthening moves such as squats and push-ups, using your own body weight, to burn calories and fat, gain strength and quickly produce lean body muscle. On the Mat: Pilates is for all age groups and body types, from beginners to professional athletes, Pilates has no boundaries. In class, we will move you in every direction; challenging your strength, flexibility, balance, and coordination. After class you will feel taller, stronger and more in tune with your core. This dynamic and physically demanding style of yoga is energetic and heating, as it flows from one pose to the next. Great for building stamina and strength. Experience meditation through movement. Prior experience not required. 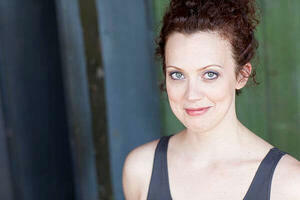 When not teaching: Allison works as a director, artistic director, pianist, and actor in Chicago theatre. Guilty pleasure: Dance Movies! Everything from Footloose to the entire Step Up franchise; I'll forgive all of the bad acting and plot devices for amazing choreography and stories about teamwork and following your dreams. When not teaching: Kaitlyn is eating!